We know mice, rats, pigs, cats and dogs are research subjects. Even primates, our closest relatives, are subject to the horrors of our research labs. And, of course, orcas are subject to research work at theme parks. But grizzlies? 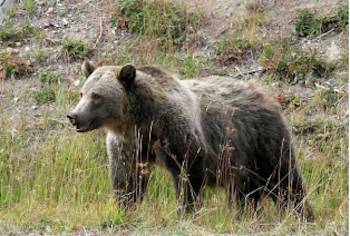 Who knew Washington State University kept grizzly bears in captivity for research? Turns out that at least 15 grizzlies have died in the past six years under the "care" of WSU research labs, according to public records obtained by The Spokesman-Review. Michael Budkie of Stop Animal Exploitation NOW! (SAEN) in Cincinnati is calling for the U.S. Department of Agriculture to fine WSU for "infractions related to animal treatment, citing bear deaths and the overdosing of three bighorn sheep," the paper reported. Let’s support his request. Please email Dr. Robert Gibbens, director of the USDA’s western region and tell him to levy the MAXIMUM FINE against Washington State University for their blatant disregard of the Animal Welfare Act when their negligence killed bears. Their negligence in staff allowing bears to become seriously debilitated should NOT be tolerated and MUST be punished to the fullest extent of the law. "Five were put down for experiments that required body-tissue samples. Four were euthanized as cubs to control the number of bears in captivity. At least two died because of human error, and the deaths of other animals have raised questions about WSU’s treatment of research animals," reporter Chad Sokol wrote. In 2010, two grizzly cubs had to be euthanized after nearly starving to death because they failed to go into hibernation. "Regardless, records show all of the center’s female bears were on a megestrol regimen a year later," according to The Spokesman-Review. Recent news reports that WSU has been negligent in its treatment of grizzly bears used for research — to the point 0f killing some of them — signifies a serious problem that needs to be addressed by the USDA. While many organizations along the west coast rescue and rehabilitate bears orphaned in forest fires and otherwise in distress, WSU has apparently killed four grizzly cubs in the past four years to avoid overpopulation in the labs. What a waste of resources. Worse still are the unnecessary and unplanned deaths of Mica, who died because of the contraceptive she’d been given, and two cubs who were euthanized in 2010 because they’d failed to go into hibernation as researchers erroneously expected. These mistakes are unconscionable. I hope you will impose the maximum fine to let WSU know this treatment and these deaths will not be tolerated and must stop.